Roger, Elizabeth and Laura, our Most Improved Runners. It was a cold and wet for the February run. Human nature being what it is, that brought out an above average number of runners: 26 including two new juniors, Raffa Janmohamed and Belle White. First home and thus retaining her title as our Rising Star was Elizabeth Brown. The handicap system makes it difficult to retain a trophy but Elizabeth defied that and beat her handicap by nearly four minutes and recorded a new personal record. Well done! Thanks also to Elizabeth for repairing the trophy which has not looked so good for many a year. Four of the first five finishers were juniors and Wilf Hillier and Freddie Brown also had PBs. 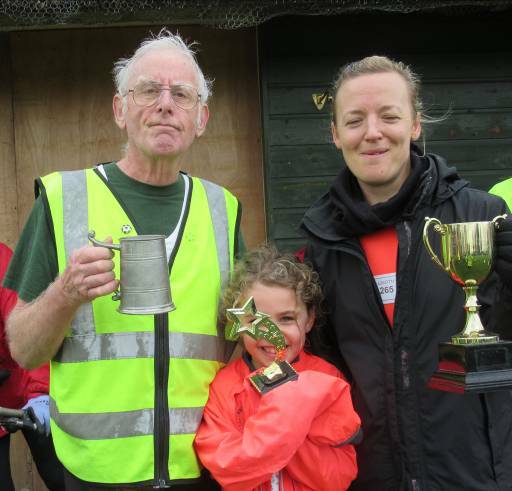 So did Laura Reynolds who was Most Improved Lady in 4th place. Well done all. The gentlemen were on a go slow this month and we had to wait until 7th place for our Most Improved Man. Step forward Roger Bradley. Well done! David Wilkie had an unusual result†. This was his second race and he recorded exactly the same time as in his first. You can't get a PB in your first run so he now has one without improving his time (though arguably this was a better performance as conditions were worse and the course was longer this time). Thanks very much to the adults who accompanied juniors, to Maggie Barber, David Gould and Sandra Doney for marshalling, to Maggie for the flapjack, to Team Smith for doing the signs, to David for crunching the numbers and to the Cricket Club for the lovely venue. Finally an apology. I inadvertently issued incorrect numbers to Raffa (who should have been 377) and Belle (who should have been 378). They (and anyone else who'd like one) can print off personalised ones here. Our next race is on Sunday 10th March, starting at the usual time of 10am at the Cricket Ground. Everyone is welcome especially volunteers to help (full training provided). Helpers will be particularly welcome for March as Jeremy expects to be at the Grizzly. † Not everyone is so lucky: we have 26 runners who have run multiple times but haven't yet beaten their first run, including four who were in the very first race, which was significantly shorter than the normal route. Finding them is left as an exercise for the reader.